“I had 4 delicata squash delivered from my local organic farmer co-op this week and had NO idea what to do with them. My husband has never liked squash much and I was determined to find a way to serve this up and have him eat at least a bite or two. 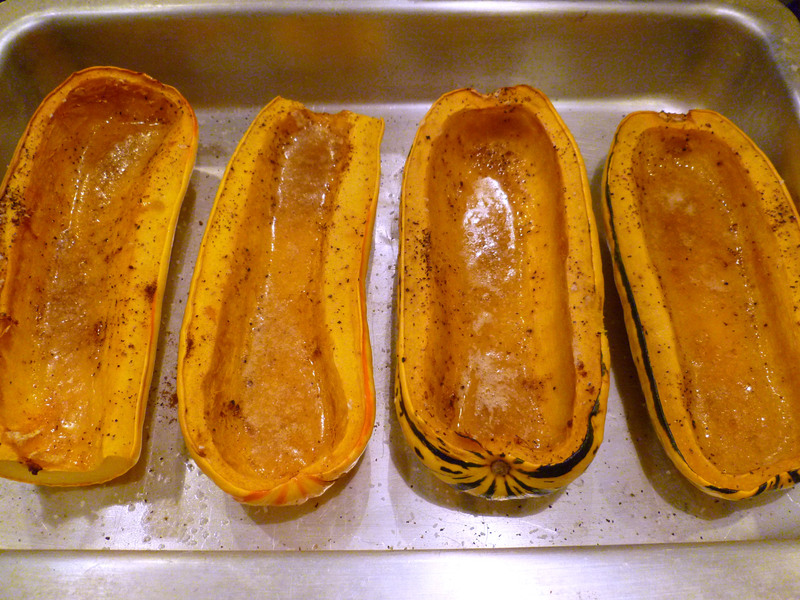 I’ve tried the usual brown sugar and nutmeg baked squash and that never has worked. I knew I wanted to put something tasty inside but I just wasn’t sure what. Nothing was inspiring me so I decided to throw together a simple rice pilaf. I love the TruRoots Sprouted Rice and Quinoa Blend that you can buy at Costco so if you are a Costco fan, look for it there. If not, you can use whatever quinoa you have around and any rice, but I would highly recommend using sprouted brown or red rice if you have it as it cooks faster and is more nutrient dense. 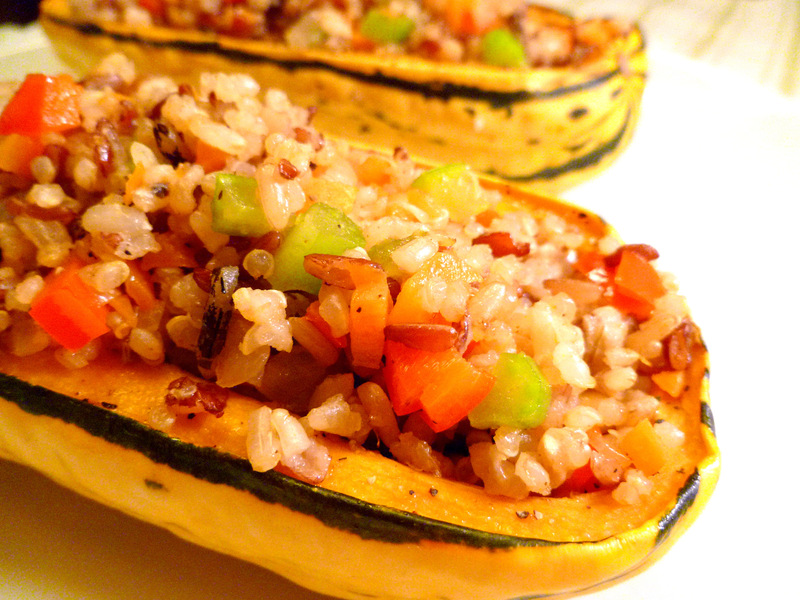 As it turns out, this pilaf and pine nut stuffed squash was a hit. The simple winter herbs, pine nuts and squash were warm and delicious. I love how colorful this dish is, too–it will quickly liven up the dinner table. My 11-year old son gave it a try first. After his first bite he ran over to my hubby and proclaimed, “Dad, you have to try this!” They returned the squash with only the peel left. One more veggie barrier broken! Now on to brussel sprouts . . . If using TruRoots blend cook 1/2 cup mixture according to package directions. If using quinoa and rice, cook seperatley according to package directions. When done, set aside to cool. Meanwhile, turn oven on to 350 degrees. 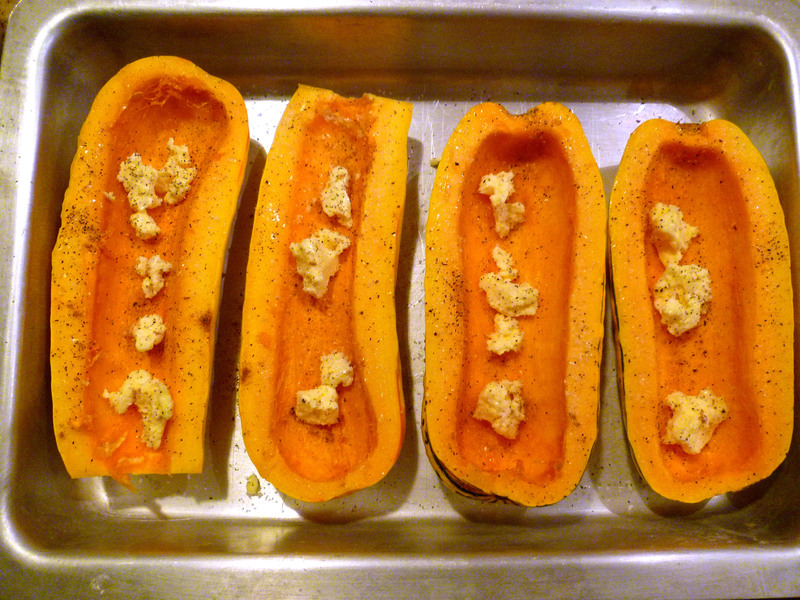 Sprinkle a pinch or two of kosher salt, pepper and nutmeg over the squash. Place in the oven for about 30-40 minutes or until tender to your liking. While squash is baking, dice veggies. Over medium heat, warm olive oil in skillet. 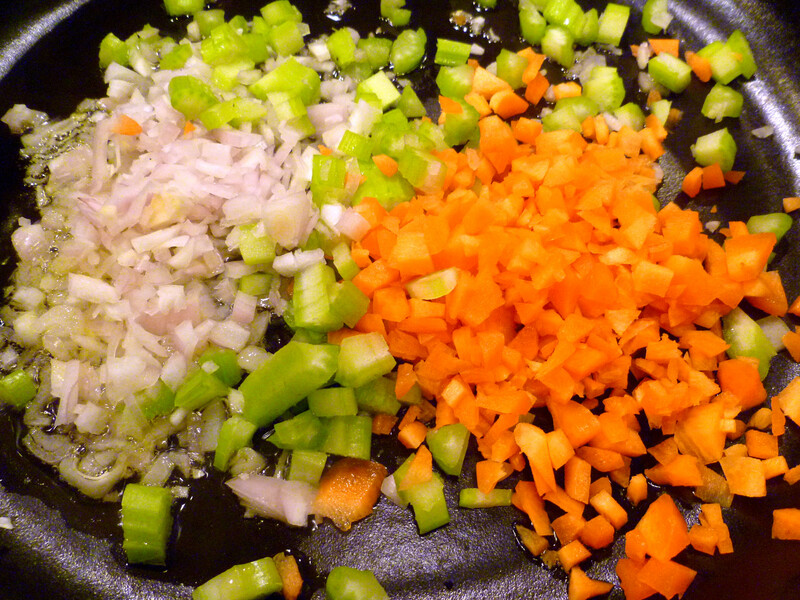 Saute shallot, carrot and celery for about 4-5 minutes until crisp tender. Add red pepper, pine nuts, thyme, cumin, oregano and a pinch or two of salt and pepper and saute another 2-3 minutes or until all the veggies are tender. Mix in 1 cup total of rice and quinoa blend (1/2 cup quinoa and 1/2 cup rice if not using the Truroots blend). You may have some extra rice or quinoa left over to reserve for another use later. Mix veggies and rice then taste for salt and pepper and add as needed. Place pilaf mixture inside cooked squash. Serve immediately. Footnotes: If you are not using rubbed thyme, you may need a litte extra for flavor. Rubbed thyme is very pungent so you wan to be careful not to add too much. Dried thyme is less flavorful so you may need quite a bit more than rubbed. Feel free to taste for herbs and add more as you like. Looks amazing!!! What local co-op do you get deliveries from? We are looking into Full Circle Farms, kind of excited about it. Give us an opportunity to try new things. Love the recipes, thanks for sharing!! Oh, exiting! You are local to me. Yes, Full Circle is who I get my delivery service from. I love it! They deliver a garden size box to me each week. You can totally change what you are getting or you can leave it to the choice they list they will be delivering. You can also order other items on there. I have noticed local stores like Whole Foods carry their produce but when I price it out, its about the same and the convenience of getting it delivered is really awesome! Let me know if you have more questions about it. I’d be happy to share! Those look delicious! I’ll have to try this. These squash look incredible! I will have to try these. I found this at Costco. It’s the TruRoots brand and they have little bags of this, Quinoa and other rice blends. I have also seen it on Amazon.com. It really is a nice blend and it cooks quickly. Let me know if you find some around where you live. Enjoy!